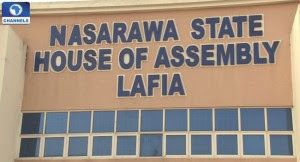 Some members of the Nasarawa State House of Assembly on Friday engaged each other in a fight during plenaries, as issues surrounding the appointment of local council administrators divided the House. After a two-year tenure of the chairmen of 11 local government areas in the state ended on March 24, the Governor, Tanko Al-Makura, appointed and inaugurated sole administrators to man the affairs of their local government councils pending when elections would be conducted. During the inauguration ceremony, Governor Almakura gave the assurance that elections would be conducted as soon as possible. The swearing in ceremony of the administrators held at the Conference Hall of the Government House was graced by traditional rulers security personnel, members of State Executive Council. The Governor’s decision, however, did not go down well for some lawmakers, as they had earlier resolved to conduct elections immediately after the expiration of the tenure of the local government council chairmen. Six out of the 24 lawmakers alleged that the other lawmakers had received money to go against their resolution. The suspended members prevented the sitting and exchange harsh words and then, a fight began. One of the lawmakers took hold of the mace, the symbol of authority, but the custodian of the symbol requested that he should be given the mace. He handed it over and ran towards another lawmaker for a fight. 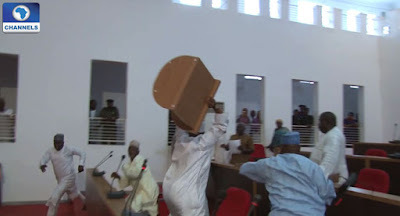 After some disagreements, one of the lawmakers moved for the adjournment of the sitting. However, few minutes after the adjournment, some lawmakers convened another sitting and moved the motion to suspend six lawmakers of the All Progressives Congress indefinitely for alleged violation of the rules of the House without allowances but half salaries. Shortly after, one of the suspended lawmakers, Makpa Malla, told reporters that they would seek redress in court before they drove out of the assembly complex angrily.